Frugal Vegan is a book of 99 "affordable and delicious" vegan recipes. 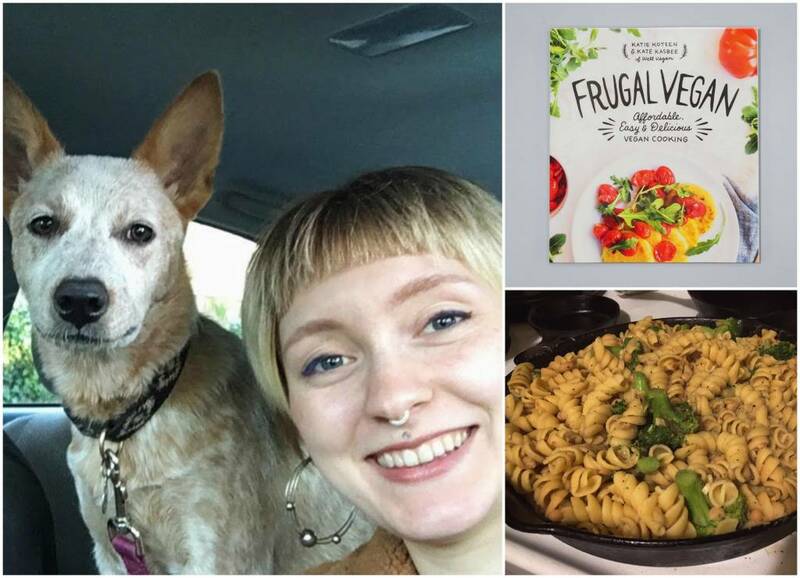 Katie Koteen and Kate Kasbee (photographer and content creator behind Well Vegan, a vegan meal planning and recipe site) wrote Frugal Vegan to show the world that vegan meals can be easy, cheap, and delicious. Using inexpensive ingredients and practical tips, this cookbook provides a cook at any level with ideas for how to create comforting and filling meals without breaking your budget. Some examples of recipes include Beer Battered Avocado and Black Bean Tacos, Chocolate Coconut Cream Puffs, Pineapple Scones, and a Crispy Buffalo Tofu Bowl. This week I chose Frugal Vegan partially out of curiosity. Can recipes with few ingredients and no "extras" really lead to a fulfilling (and well, filling) meal? I'm a big fan of flavors on top of flavors-- I smother everything in garlic, nutritional yeast, paprika, and oregano if given the chance-- so approaching a meal with just red pepper flakes, salt, and pepper did not sound overly appetizing. But I also know that sometimes the simplest meals turn out the best! I also chose this cookbook because it seemed like the authors were fans of simplicity and flexibility; I could adjust basic ingredients more easily because there are so few involved in each recipe. That's the kind of freedom I value when cooking! The recipe was wonderfully easy, somewhat similar to making homemade mac n' cheez but even more simple because nothing needed to be expertly mixed or blended! The only time consuming part was smashing white beans with a wooden spoon, and even that was strangely satisfying and fun-- like mashing tiny potatoes, but way easier. I encountered no problems in the preparation and didn't have to waste any time trying to decipher complicated instructions. All in all, this ended up being the quickest dinner I've made in awhile and was also quite nutritious, with beans and broccoli being the main ingredients. A win-win, if you ask me! After tasting the pasta with only the recommended four cloves of garlic, red pepper flakes, salt and pepper, I felt the need to add more spices. The flavor was good but not exceptional, and I found myself wanting some more variation other than just spicy-salty. I added some nutritional yeast and some Italian spice mix (rosemary, basil, etc) which made the flavor much more dimensional. My partner and I also drizzled some Sriracha ketchup on top (mostly because we are obsessed with that stuff right now...) and ate some pickled asparagus and olives on the side, which was an A+ combo. In the end this was a very comforting meal! It was like eating a casserole or mac n' cheez mixed with pasta salad. Though I added additional spices, the amount of flavor the dish had initially with only three main ingredients and three spices was pretty impressive, and even without my additions the meal still would have been extremely filling. I would not be disappointed. Plus, once I tasted the pasta as-is it was super easy to see what sides or sauces would pair well with the flavors in the dish. That was the most fun part of this recipe-- getting creative with what I had to push this frugal recipe to the next level. If you're looking for a vegan cookbook that has recipes that won't require any outrageous or expensive ingredients, don't take a long time to prepare, and end up inspiring you to explore different flavors and side dishes to complement the meal, you've found it. I would recommend Frugal Vegan for someone who is sticking to a tight budget; enjoys simple, quick, flexible meals; or is beginning to experiment with veganism, or cooking, or both!